Aaron Birnbaum, Untitled ­– Country home with rainbow, 1985-89. Oil,acrylic,varnish, graphite, on wood panel. 15.75 x 72 in 40 x 182.9 cm. Courtesy Kerry Schuss, New York. Aaron Birnbaum in his apartment, 1990, New York. Filmed by Kerry Schuss. Courtesy of Kerry Schuss. Aaron Birnbaum, Untitled – Landscape, c.1975. Oil, Varnish on wood paneling 24 x 24 in. Courtesy Kerry Schuss, New York. Self-taught artist Aaron Birnbaum found recognition late in life. Born in 1895 in a small town in Ukraine, Birnbaum and his family immigrated to Brooklyn when he was in his teens and there he began working as a tailor. He took up painting after retiring from the garment business and painted until he was 101 years old. In 1997, at age 102, Birnbaum attended a retrospective of his work at The Aldrich Museum of Contemporary Art in Ridgefield, Connecticut. Birnbaum refers to his vibrantly colored paintings as "remembering pictures" because they are never painted from observation, but represent a lifetime of recollected experience, stretching from his childhood in Europe to recent observations of life in New York. The paintings of memories from his youth—scenes of life in a small town, views of farms, forests, and likes—are generally colorful and romantic. 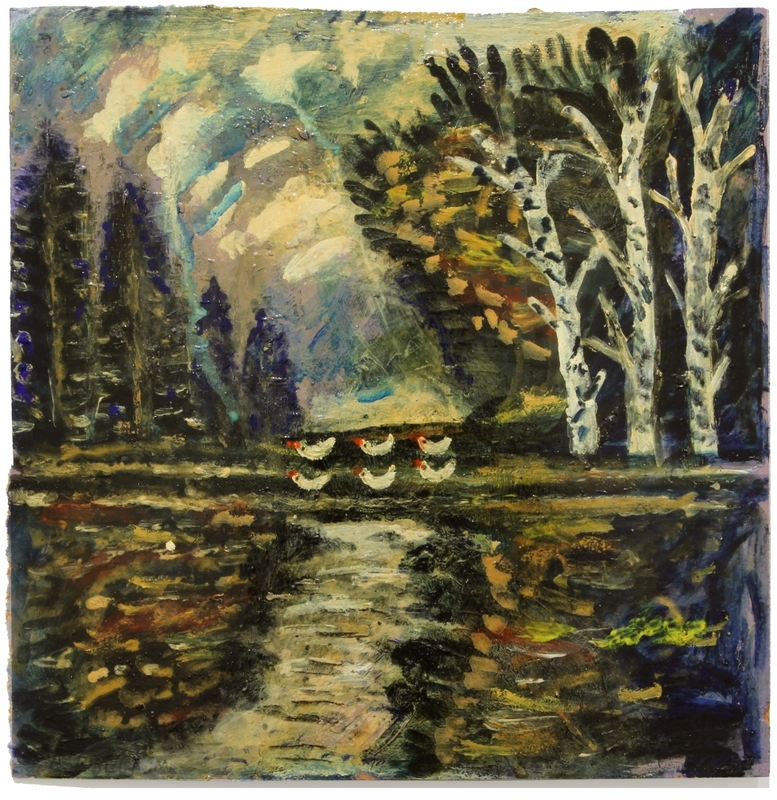 In the late 80s, Birnbaum began working with gallerist Kerry Schuss, who fondly describes him as “a true folk artist”. The short video above, filmed in 1990 by Schuss himself in Birnbaum’s New York apartment, captures the artist as he explains his process. For Independent 2018, Kerry Schuss will present a solo exhibition of paintings by Aaron Birnbaum (1895–1998), curated by contemporary artist Matt Connors of CANADA. Aaron Birnbaum, Untitled – Landscape, 1988. Acrylic, varnish, canvas, back of found painting, 30 x 40 in, 76.2 x 101.6 cm. Courtesy Kerry Schuss, New York.